Tune in weekly to expand your mind with the “Awaken Your Inner Superstar” with Michelle Villalobos as she prods, pokes and probes a diverse mix of the planet’s most innovative minds in business, psychology, personal development and more for game-changing ideas, transformational stories, and entrepreneurial best practices. Listening to this show will help you create more freedom, more fortune, more fulfillment and more FUN in your business and life. Guaranteed. Want to be a guest on Michelle's Podcast? Yes, I want to be interviewed! #69. Sally Hogshead – The Fascination Advantage: How The World Sees YOU! Looking for a specific episode, topic or guest? Enter key words above. These are all solo episodes led by Michelle on business alignment and growth strategies. If you're looking for inspiration, mentors and techniques for mindset and personal development, these episdoes are for you. Want ideas to attract and land more business? Check these out. United States 2019-03-12 5 Skysteward Right To The Point I love this podcast! Why? Well, Michelle wastes no time in providing valuable, motivating info you can use right off the bat. Her guests are just as generous and it’s super inspiring. United States 2019-02-28 5 name lady Satisfies the Left Side of the Brain Listeners get to hear a summary of the upcoming show at the start of each episode, so that one immediately knows if this particular episode is covering a topic of interest to your business. Michelle consistently has experts on her show that share information about their respective topics. There is not a lot of idle chit chat where one's time is being wasted. Instead, it is an informative show with pertinent topics being covered. I especially enjoyed the on on LinkedIn, as if you are not on LinkedIn, you are Linked Out! United States 2019-02-27 5 Alexandra Stockwell Great Topics! Michelle's podcast has a lot of variety and is always relevant. United States 2018-10-30 5 KMG305 My best business resource Somehow this podcast seems to always hit me right where my business needs it! The insight is valuable and the wisdom is unmatched. This is my go-to resource for steering my business growth. I also love Michelle and how open and helpful she is from the heart. United States 2018-10-24 5 Ashleigh Hernandez Speaker Amazing, Inspiring, Intellectual I first saw Michelle at a Women’s Chamber of Commerce event, I was hooked. That was two years ago! She delivered so much content in such a short time, and she just hasn’t stopped! She delivers incredible value for people that have dreams and aspirations to be all they were created to be! She is a Superstar and doesn’t shy away from helping others become the Superstars they were meant to be! She keeps me striving for my “A-Game”, and I am so grateful for everything she puts out!! This podcast should be up there with Oprah’s Super Soul Conversations!! Thank you Michelle!! United States 2018-10-19 5 AClimer Excellent interviews and great content! I love this podcast! I started listening after seeing Michelle speak at a National Speakers Association conference. Her workshop content was excellent and I was pleased to find her podcasts are just as good. Michelle is such a great interviewer! Her questions are spot-on and she is focused on providing actionable content to listeners. I'm applying many things I've learned from Michelle and her guests and I'm loving it! United States 2018-10-10 5 Random Conversationalist Inspiring practicality MIchelle Villalobos’s Awaken Your Inner Superstar is great for people who are looking for practical wisdom that makes real sense, gives us real ideas for implementation. As I listen, two things happen. I am taking notes to act on. I’m creating a plan. And I’m getting motivated to act right away on what I’m learning. This a 5Star Podcast. United States 2018-09-12 5 Mnbvcdrtfhjk Practical and current! This is a wonderful podcast. Amazing guests! Always great information. Insights to grow as a person and in business. Congrats, Michelle! United States 2018-08-28 5 Bosslady Coach Clarity and vision. Michelle Podcast is very valuable for clarity in the very best next step for your business as well as long term vision. I love that it has a holistic approach to building your business and provides views in many areas of conscious entrepreneurship. United States 2018-07-21 5 Maxxsells Great podcast Love your level headed non giggling serious business advice ~ as soon as I hear a giggling podcaster I delete - your information is spot on and done very professionally - I am impressed! United States 2018-07-02 5 Jasmin Terrany Worth the Time! Whenever I listen I get valuable content that helps improve my business and life. Michelle has an easy rapport and adds tremendous knowledge, value and heart to these conversations. I don't listen to any other podcasts. United States 2018-06-28 5 RedLeafCreates BEST PODCAST! I've never been into listening to podcasts. My coach recommended this one and I am hooked! Can't stop listening. United States 2018-04-13 5 RuchtD Michelle is really a super star ⭐️ I met Michelle about 7-8 years ago during one of her events in Miami and I have been following her and her business ever since. Them a got an email from her announcing her first podcast episode. When I listened to her podcast for the first time and immediately subscribed to it and recommend to my friends and even my fiancé. I love how genuine she is to the audience and she is sharing the Insides on how she have been growing her business. I'm specially thankful for the series on how to build a business alined with the lifestyle you want to have. I saved all the episodes and I'm looking forward to hear more. Thank you Michelle. Keep the good work. United States 2018-04-11 5 Jessica Kizorek Review Great Content MiVi! As always Michelle is gifting fantastic content! Love the insights, variety and people she chooses to feature. GOOOOOOOOO MiVi! Love what you do, and admire your effort. United States 2018-04-03 5 CLRamsey13 The best for entrepreneurs obsessed with personal development! I can't say enough GREAT THINGS about Michelle's podcast! As someone who loves to learn new things, I always look forward to listening to Awaken Your Inner Superstar. Michelle is a gifted interviewer and has a natural way of getting the most from her time with each guest. She asks the questions you'd ask yourself, and does a good job of summarizing the key points...a real plus if you're listening in the car and you're unable to take notes! I always come away with something new to implement in my personal and professional life, as well as inspiration to stay focused and persistent. I highly recommend this podcast for existing or soon-to-be entrepreneurs and those that want to utilize their gifts and talents to make the world a better place. United States 2018-03-22 5 nine dots MICHELLE IS AWESOME SAUCE! After the amazing oportunity to see Michelle live, I came to check out her podcast - glad I did. It is awesome! Great host, great guests, great content - with actionable insights you can use now. Positive, useful, relatable. 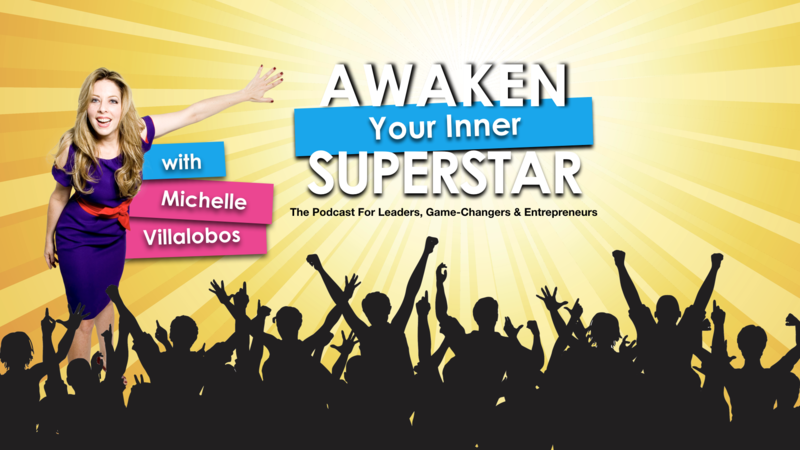 If you want to get some great edutainment - check out Michelle and Awaken Your inner Superstar! United States 2018-03-13 5 Chiccitylivinh Helps my business All this information is gold!! Who needs an MBA when there’s this podcast?! United States 2018-01-16 5 Sareet M. An inspiring interview! I most recently listened to Michelle Villalobos' interview with Albert Pellissier. There are many nuggets of wisdom which are delivered in a kind, compassionate ( and witty ) manner. If you are sick and tired of " being sick and tired ", consider listening to this interview. I look forward to hearing the other interviews, as well. To each of you, thank you for all which you are doing to empower others! United States 2018-01-12 5 Albert Pellissier Michelle is the Real Deal In the professional speaking community you'll hear people refer to someone as "the real deal". The meaning of this phrase is that the person is authentic, truly cares, and genuinely motivated to share their knowledge for your ultimate benefit. It's something you instantly know one way or the other after watching or listening to someone present, a gut feeling of trust that this person will be good for you. Without a doubt Michelle Villalobos is "The Real Deal". United States 2018-01-01 5 Kendall SummerHawk Kendall SummerHawk Michelle's insights about what it takes to stand out in today's crowded market are fresh, inspiring and right on target. This podcast is now one of my faves! United States 2017-12-21 5 R. Shawn McBride Chief Innovation Officer Michelle is one of the world's leading experts in thought leadership. And in this podcast you get her expertise - for FREE - delivered right to you. I must say I've been impressed with the content. And I am looking forward to seeing more of her work in the near future. It's on my short list of subscribed podcasts. United States 2017-11-17 5 Anne Gordon de Barrigon Inspiring Words Michelle is a talented interviewer and knows how to find the value that each of her guests have to offer. I love, love, love the Sharon Lechter interview. Such great words of wisdom, advice, encouragment and inspiration. I look forward to listening to more of Michelle's podcasts. Thank you Michelle for sharing your talents and gifts and those of your guests with the world! United States 2017-11-17 5 meee._.aaayyyee Just the Right Mix of Inspiration & Business Savvy This is a great podcast to fill drive time and other down time with inspiration and knowledge. Michelle's interview approach is down to earth and draws out practical elements that can help propel superstar listeners forward. Looking forward to listening regularly! United States 2017-11-12 5 StellarStrategy Informing and inspiring Love listening to Michelle and her guests share their wisdom and tips on running successful businesses. Michelle’s authenticity and enthusiasm captures the listeners attention and her ability to make the issues and subject matter relatable to her listeners keeps us wanting more! Keep it up Super Star! United States 2017-11-01 5 dartstina Inspirational! I've recently started listening to podcasts as part of my personal career and professional development efforts, and Michelle's is extremely useful. Not only is it motivational and inspirational (you can do this!) but Michelle also finds way to provide actionable tips and examples from her guests that you can use in your own life. Definitely one to subscribe to and listen to regularly! United States 2017-11-01 5 JBCreations Wow, I love this!! Just listened to Episode 1 so far with Mike Motorbike of Profit First and got so many gems!! Around time and money managements and best hiring practices. Thank you Michelle for creating this show and making it so fun and interactive! This is bliss for any purpose-driven entrepreneur. I'm already a devoted fan! United States 2017-10-30 5 Lisa The Love Coach MICHELLE ROCKS IT!! Loving this Podcast and Michelle's fun vibe. She knows what questions to ask because she's so strategic and knows exactly what we, the listener wants to know from these great guests!! United States 2017-10-30 5 Mike Ambrosino Michelle is a great host Michelle is a great host, I love the questions she asks, and the unique people she has been able to bring on. She is such a rock star! United States 2017-10-28 5 Mc03062012 She delivers ultimate value again!!!! What can’t Michelle V do? The content of her new podcast is phenomenal, relatable and action oriented. The interview subjects are great but the way in which Michelle walks them through and relates to their topics as it has applied to her makes it real. United States 2017-10-25 5 CoachIDC Supercharged Superstar Michelle’s Superstar work helps to elevate entrepreneurs and the planet. The message in these podcasts is clearly communicated to the audience. Michelle Villalobos is a rockstar visionary and the launch of this podcast is the “cherry on top” for her awesome work! I have binged listened to the first 4 episodes and can’t wait to hear the next ones. It’s fuel for my soul during my early morning rides to work. Thank you!! United States 2017-10-25 5 Christy Largent Inspiring and Entertaining I sure have enjoyed this addition to my business podcast playlist. Michelle is thoughtful with her questions and brings the best out of her guests. Way to go! United States 2017-10-25 5 Chi Gal 53 SO GOOD! I’ve followed Michelle’s work for a while and I love her! So positive and uplifting while giving great content. Highly recommend! United States 2017-10-24 5 Karen Russo Michelle is a Super Star! Energy, ideas, and new perspectives -- enjoy and prosper! United States 2017-10-24 5 Lizrebo Incredibly impactful! Michelle hits it out of the park once again! Michelle Villalobos has a unique way of making you feel like she is talking right to you, like you are having a 1:1 meeting. In each of the informational and motivational podcasts, she provides amazing value. I love the line up of guests, who are leaders in their respective areas and wonderful resources. Michelle's focus is to have her listeners lead a higher quality of life, both personally and professionally. What's not to love? Very excited about this podcast series! United States 2017-10-24 5 Jessie @ Light Up Learning As I Expected Michelle hits the target every time! The interviews are insightful & powerful in their respective messages, but more than that, they move you to act, which brings on real transformation. Bravo! United States 2017-10-24 5 Andy Storyteller Henriquez Exactly What I Needed I am a huge fan of personal development and I am always seeking to get insight, strategies and tips from experts in their industry. I came across Michelle's podcast and let's just say this is exactly what I was looking for. Michelle has somehow managed to connect with amazing entrepreneurs and thought leaders and bring forth their brillance in such an awesome way. I am a fan and you will be to when you toon in and subscribe. United States 2017-10-24 5 Michelle at Nurturing Moves Michelle is a Superstar!!! I have taken many courses and seminars with Michelle and she has been one of the biggest inspirations in my career... she is such a powerhouse of a woman, who believes everything is achievable. So happy to see her here in podcastland, as I know she only brings the best of the best in everything she does! United States 2017-10-23 5 Kettlebell305 If I felt any more excited I'd be worried! Im truly excited for Michelle and I cant wait to be inspired and educated from all her network professionals. She owns her genius and her voice is pleasant yet powerful. Im all ears my friend! United States 2017-10-23 5 Akanino A Must Listen Prepare to be awaken and inspired. I truly enjoy listening to these episodes. United States 2017-10-23 5 Joy is One of a Kind Michelle Rocks! Michelle Villalobos walks her talk and gives business owners the tools they need to create the most thriving, profitable businesses they can. In her weekly podcast, Michelle attracts some of the biggest influencers that we have in our world today. Thank you Michelle! This podcast is a treasure of information, resources and relationships. United States 2017-10-23 5 Marly Q I’m Hooked! This podcast is totally worth your time! Only 3 episodes in and ... I’m hooked!! Michelle Villalobos, and all her guest interviews, are SUPERSTARS we can all learn so much from. Thank You for being the SPARK helping others SHINE!! United States 2017-10-22 5 MiamiAnnie Great interaction! Good topic. Informative. Great job Michelle! Looking forward to the next one. United States 2017-10-20 5 Patitamariposa Happy to have the podcast I’ve been following Michelle for years by attending her workshops and online webinars. I’m excited about this podcast because she has so much valuable information which she shares so willingly without expectations except for people to grow in every way. This will be a go to weekly podcast to learn more ways to maintain my inner star. United States 2017-10-20 5 Suzy Jewell Michelle Always Energizes Me!!! Leave it to the SuperStar herself, Michelle V., to lift my vibe, set my mind right and capture the inspirational story of Alina in such a way that any of us late-comers to the game can feel good about starting here, staring now. Look forward to the rest of the podcasts and congratulations!!! United States 2017-10-20 5 camcam Midtown Pawn Boutique Love the content and really enjoyed the interivews!!! United States 2017-10-20 5 Fahma Josh Designer Michelle great podcast! I loved your episode with Mike. Can't wait to listen to your next show. United States 2017-10-20 5 Jessytai My favorite new podcast! Michelle's podcast has given me the inspiration and clarity I've been searching for! Love the content and guests thus far. I can't wait to hear more episodes! United States 2017-10-20 5 LeeAnn Webster Interesting & Insightful As a super star herself, Michelle definitely "knows it when she sees it." Her interviews are fun, insightful and heartfelt. Michelle has that unique ability to extract information relevant to both up and comers and those already successful. And she has fun in the process. She has access to a broad spectrum of people, so there's a little something for everyone. I highly recommend tuning in!! United States 2017-10-20 5 May may 84 Tangible Transformation Michelle is authentic and genuine who leads by doing and showing. This Awaken your Inner Super podcast is a shot of cafecito (for those from Miami) or espresso for your soul and business. Using her own experience and network she brings information and guides you to outcomes that make it worth every minute and more. Michelle brings you high value thought leaders and shares knowledge that creates ROI in yourself and your career. Do you have a dream of....? You fill in the blank and get to listening to make that dream your reality. United States 2017-10-20 5 zwaggawz Michelle is Epic! I met michelle almost 4 years ago at a conference and immediately I was inspired by her energy, laugh and her passion for life...This was all before we even exchanged words! Michelle is brilliant and I've had the pleasure of watching her help so many, including myself, get clarity and vision on what matters most. If you have the chance to drop in, receive and implement the wisdom, life will be brighter! You rock Michelle!